Orca III recently supported Nick Hancock in his reconnaissance of Rockall. 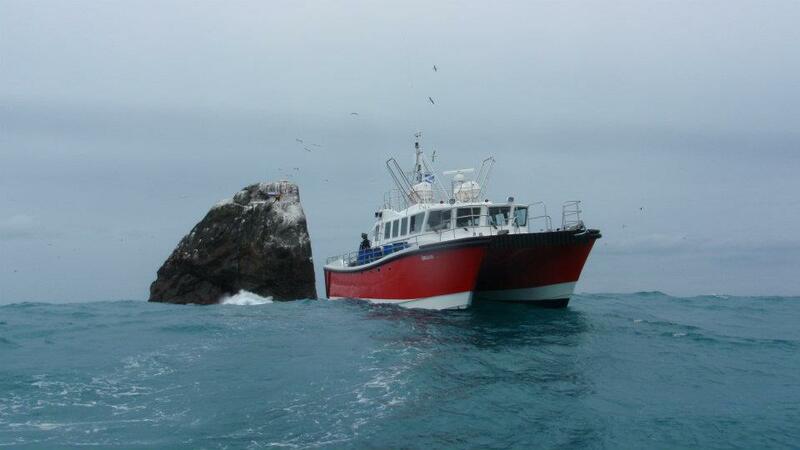 Orca III is now operational and regularly running to St Kilda. A wildcat 53 with a large deck area, davit, moon pool and multibeam gantry, she is ready for extended ocean operations. "Supporting ocean operations from the Outer Hebrides to Rockall and from Northern Ireland to the Faroes." Atlantic Marine Services draws on a broad and diverse range of local maritime knowledge and experience gained through operations around the Outer Hebrides and Atlantic, aiming to provide customers with maritime resources, logistics and local support required for ocean operations based from the Outer Hebrides. The North East Atlantic operating environment is a complex area with changeable extreme conditions and severe local effects. Atlantic Marine draws upon generations of local experience and knowledge based from the Isle of Harris in the Outer Hebrides to support your operations across this vast area.